What is a Temporary Food Establishment? A Temporary Food Establishment (WAC 246-215-131) is where a person prepares or sells foods with a fixed menu at a fixed location for (a) no more than 21 consecutive days in conjunction with a single event, such as a fair, or (b) no more than three days a week in conjunction with an approved, recurring event, such as a farmers market. Who needs to get a Temporary Permit? All individuals or groups planning to hold events that serve food and are open to the public are required to obtain a permit. If you advertise (with newspaper, television or radio announcements, flyers, signs, banners or other means) to the public, you are required to get a permit. Why is a Temporary Permit Necessary? Food service is serious business, as is preventing foodborne illnesses. A temporary permit is required by state law (WAC 246-215). The state food regulation states that all retail food establishments must have a valid permit conspicuously posted in the establishment. The temporary permit is issued after consultation with the health department. We will review your application to find ways to increase your efficiency and safety, and possibly limit your menu or preparation steps to protect public health. How to Get a Temporary Permit? Complete the temporary application. Return the completed application to our office at least 14 days before the event. Applications received 1-13 days before the event will be charged a late fee, as noted on the application. Have your application reviewed and approved by one of the health district's Environmental Health Educator. Pay the appropriate fee (the fee schedule is printed on the application). Make sure at least 1 person with a valid Washington State Food Worker Card is in the booth at all times. Post the permit in your booth. Temporary food booths must meet many of the same requirements as permanent establishments. Because of the lack of certain facilities however, temporary food booths also have restrictions that do not apply to other establishments. As a temporary food booth operator, you are responsible for maintaining your booth to meet Washington State food service (WAC 246-215-131) requirements. At least one food worker with a valid Washington State Food Worker Card must be in the booth at all times. The card, or a legible photocopy, must be posted in the booth. Any person with a communicable disease, such as with diarrhea, vomiting, or a fever; or with open sores or infected cuts on their hands, may NOT work in any food establishment. Eating, smoking and drinking are not allowed in the food preparation areas. All unauthorized people must stay out of the food preparation areas. Animals (including service animals) are not permitted in the food preparation area. All food booths must be within 200 feet of a restroom with handwashing facilities including warm running water, soap, and paper towels. All food preparation and storage must be done toward the back of the booth or otherwise protected from public contamination. When using a grill or hot oil, the equipment must be separated from the public by at least 4 feet to protect people from burns. All food preparation and storage areas must have a weather-proof, overhead cover. Lights must have safety shields to prevent food contamination from broken glass. Food contact surfaces must be smooth and easily-cleanable. Flooring should limit mud and dust. ALL FOOD PREPARATION must be done in the booth or in an approved kitchen facility. Approval must be granted by the health district in advance. All food establishments must prepare fresh sanitizer before food preparation. A sanitizer is used to destroy germs (bacteria and viruses) on clean surfaces. A common, approved sanitizer is 1 teaspoon of regular, unscented bleach (5.25 percent sodium hypochlorite) in 1 gallon of cool water. Sanitizer may be kept in an open bucket with clean wiping cloths or in a spray container. Once a surface is sanitized, it should be allowed to air-dry. Sanitizer and wiping cloths must be replaced frequently throughout the day. If you do not have a 3-compartment sink, you must take 3 dish basins for dishwashing. Also plan on how you will supply adequate amounts of hot water and dispose of the gray water. Potentially Hazardous Foods (PHF) are foods that let bacteria grow quickly. 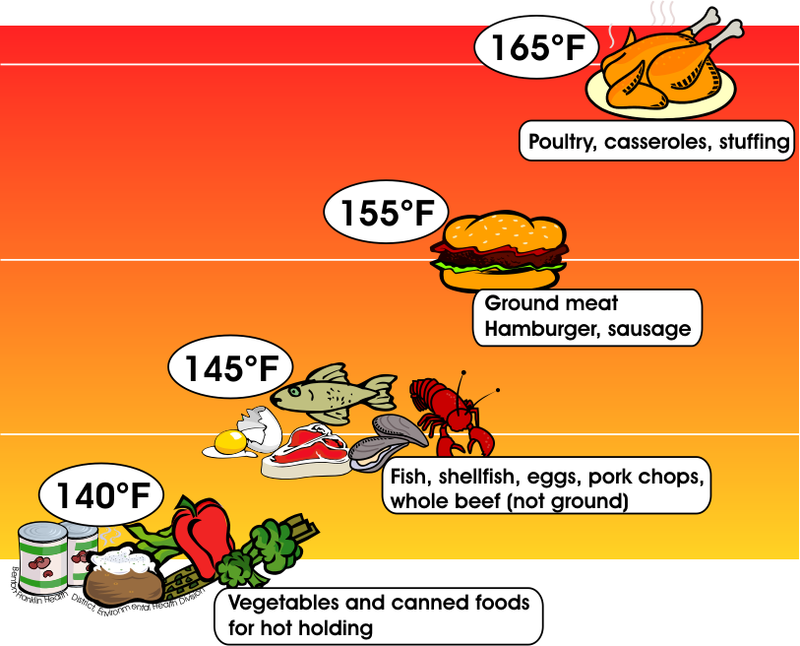 A metal-stem thermometer is required to check the internal temperatures of all potentially hazardous foods. Thermometers are available at restaurant supply and larger department stores. Thermometers must be able to measure from 0-220ºF and must be accurate to ± 2ºF. Click here for calibration procedure. Room temperature storage of potentially hazardous foods is not allowed. Potentially Hazardous Foods found in the Danger Zone are subject to disposal, destruction or removal from sale. Keep it Hot, Keep it Cold Or Don't Keep it! Electrical equipment is requested for hot-holding. Due to electrical problems at past events however, propane stoves or grills capable of holding food at 135ºF or hotter may be used and/or should be available for backup. Canned heat (ex: Sterno) is only allowed for short (less than 3 hours), indoor events. Mechanical equipment is required for cold-holding at events over 8 hours. Due to a history of electrical problems at past events, however, an ice chest (with ice from an approved source) may be required to replace a poorly-operating refrigerator on a hot day. NOTE: Know your electrical needs! We will ask you how much equipment you will be using at the event. Events in our area may not have adequate electrical capacity for your plans. We may have to limit your menu or plan for alternative energy sources (such as a generator or propane). 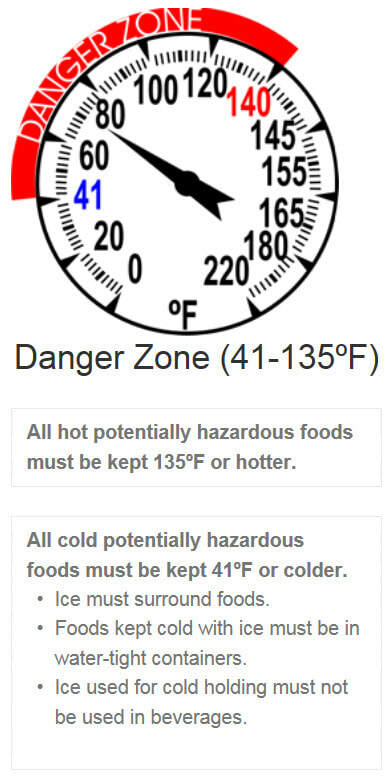 All foods that have been heated through the Danger Zone (41-135ºF) must be discarded at the end of the day. Cooling of foods at temporary events IS NOT generally permitted. You are required to prevent bare hand contact (BHC) with all RTE foods. Gloves. Change your gloves when they become contaminated or ripped. Remember to wash your hands each time you change gloves. Buy pre-shredded cheeses and pre-sliced vegetables. Buy commercially-prepared potato and macaroni salads rather than preparing your own in the booth. Use a separate cooler for raw meats. Be sure to store raw meat in water-tight containers. Buy pre-cooked (commercially cooked in a USDA facility) hamburger patties and sausages. These are available from larger grocery stores and restaurant supply warehouses. Use separate cutting boards and areas for raw meat preparation. Clean and sanitize all equipment and surfaces before beginning RTE food preparation. 19. Chemicals used near foods must be food-grade. Store chemicals below or away from all food storage and preparation areas. Keep all chemicals labeled. 20. Food and single-service articles. Store all foods and single-service articles protected from contamination--off the ground and under a water-proof cover. All foods must be covered to protect from insect, animal, or dirt contamination. Unless otherwise approved, use only disposable plates, utensils and cups to serve food to the public. Condiments must be in individual packets, squeeze containers or in containers with lids or protected with sneeze guards. 21. At least one garbage container with a tight-fitting lid must be available in the booth. Garbage must be emptied regularly. 22. All liquid waste must be dumped into a city sewer or health department-approved waste-water dump. Streets, storm drains, portable toilets and the ground ARE NOT approved waste-water dumps. Washington State requires that all food workers have food safety training before handling food served to the public. Food workers who take a food safety training class and pass the State of Washington exam on food safety basics are issued a Food Worker Card (also called a Food Handler Permit). Am I a food worker? You are a food worker if you work with unpackaged food, food equipment or utensils, or with any surface where people put unwrapped food. Do I need to get a food worker card? Yes. All food workers are required (Chapter 246-217 WAC) to have a valid food worker card to work in Washington. It's important that your card, or a copy of it, is with you at work and available for the health department to check during a food inspection. Can I start work before I get my card? Yes, you can work for up to 14 days before you get your card – if you get food safety training from your employer. Can I get my food worker card online? Yes, all local health departments offer the food worker training, test, and card online. The only authorized online training program is www.foodworkercard.wa.gov. Other websites that appear to offer a similar card online are not valid in Washington. What does a card cost? A food worker card cost $10. Once you have a food worker card, we recommend that you keep the original and provide a copy to your employer. Can I work anywhere in Washington with my card? Yes. You can use your valid Washington State food worker card anywhere in Washington. If you move or get another job in a different county, your food worker card goes with you. Can I use a card I got in another state? No. You must have a Washington State food worker card to be employed as a food worker in our state. Is there a study guide for the food safety exam? Yes. Food and Beverage Workers' Manual is a study guide to help prepare you for the food safety training class and exam. The manual is available in seven languages, including Braille upon request. I lost my card. Can I get a replacement? Yes. If you got your card online, sign back in to www.foodworkercard.wa.gov. After you select your language and follow the prompts, select “Returning User.” You will need to enter your registration information and answer your security question exactly as you entered it when you were a new user. Choose “Replace My Valid Food Worker Card.” A payment may be required. How often must I renew my card? Your first food worker card is valid for 2 years. Before the card expires, you must take the food safety training class and pass the exam again. Renewal cards after that are valid for 3 or 5 years. Can I get a renewal card if I have a current valid card? Yes, you may apply for a renewal card if your current card is less then 2 years old (a current card that will not expire until 1 to 60 days after you get your renewal card.) You must show your current valid card when you apply for a renewal. Do renewal cards last longer than my first card? Yes, renewal cards are valid for 3 years from the issue date. You can get a renewal card if you take a food worker training class and pass the Washington State exam. Is there a renewal card for people who have extra training? Yes. You can receive a 5-year renewal food worker card, if you have a current card and can show that you have had "additional food safety training" within the past 2 years. "Asotin County Public Health leads the community through education and evidence-based practices to prevent illness, promote health, and protect the environment to improve the quality of life in our communities."